"Sampath Speaking" - the thoughts of an Insurer from Thiruvallikkeni: ill-directed anger of Upton and Butler - Mankad is nothing new !! ill-directed anger of Upton and Butler - Mankad is nothing new !! Heard of : Keemo Mandela Angus Paul, a 17 year old from Guyana, bats right handed and bowls fast right arm ~ and how do you connect him with ODI 459, the 9th match of Reliance WC played at Gadaffi Stadium, Lahore in Oct 1987 ? Have seen Ashok Mankad play at Marina; he was touted to be the great cricketing brain in India, especially leading Mafatlals in Buchi Babu Trophy. His father Mulvantrai Himmatlal Mankad known as Vinoo Mankad was more illustrious taking 162 wickets and scoring 2109 runs in Tests. At Chennai way back in 1956 against New Zealand he hit 231 in an opening partnership of 413 with Pankaj Roy which stood as a record for 52 years. Yesterday in IPL, dugout pundits initially predicted the visitors would end up with an under-par 144. But in the next five overs Kings XI plundered 70 runs, treating those middle overs as the death overs, destroying another established tenet in T20 cricket. Incidentally, in the final four overs, with Gayle having departed, Kings XI managed 39. Of those 70, Gayle scored half and did not spare any of the Royals' bowlers including the much-vaunted Jofra Archer. 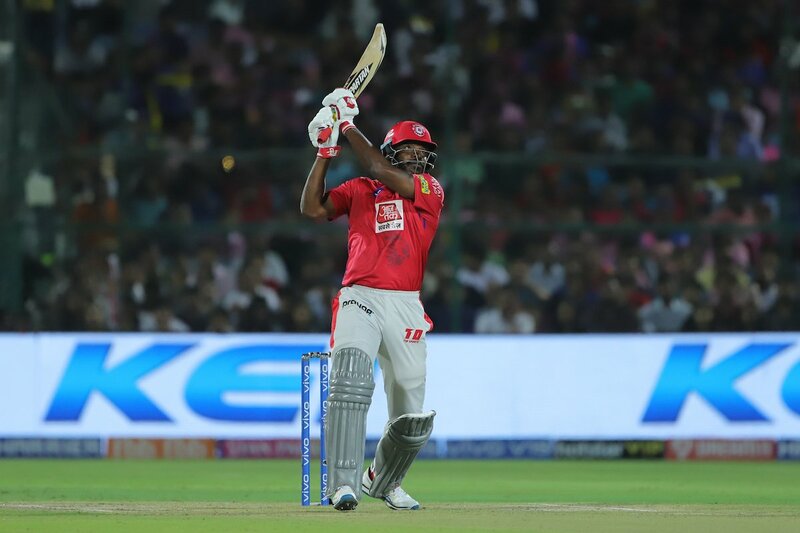 In fact, Archer's first delivery to Gayle in the evening was an fiery 149kph toe crusher from around the stumps. Archer wanted to cramp Gayle with the new ball. Gayle knew it. He bided his time. By the time he faced him next, in the 14th over, Gayle nonchalantly picked a length delivery outside off stump and dispatched straight for a six, picking 10 in the over. Jaydev Unadkat (19 runs) and Ben Stokes (14 runs) also suffered at Gayle's hands before the Jamaican pulled the Englishman into the hands of deep midwicket to miss out on another T20 century. At that point, 15.5 overs, the Forecaster had gone up to 180. Jos Butler reignited the spirit-of-cricket debate ! ~ he was run-out – shouted at Ashwin trying to find fault with the way of the dismissal .. .. Running in to deliver the penultimate delivery of his final over, Ashwin stopped after entering his delivery stride. Buttler didn't have his eye on the bowler and slipped out of the crease. As soon as he saw that, Ashwin simply turned around and broke the stumps at the non-strikers' end with the batsman out of his crease. The decision was sent up to the third umpire, who didn't need much time to send Buttler on his way. 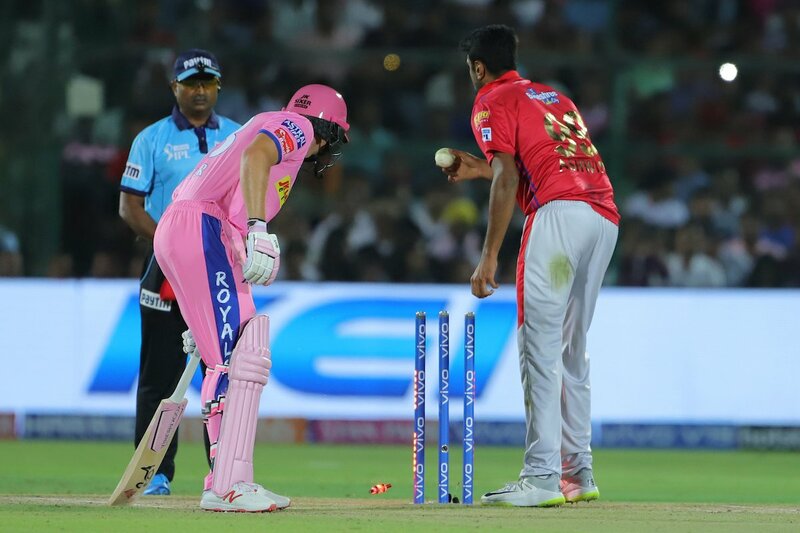 An irate Buttler had an unpleasant exchange with Ashwin, the Kings XI Punjab captain, while the third umpire made his decision. He walked off angry, and was seen shouting in the general direction of one of the dugouts. Speaking at the post-match press conference, Ashwin said of the incident: "Look, it was very instinctive. On my part, it was very instinctive. It was not planned or anything like that. It's there within the rules of the game. I don't understand where the spirit of the game comes, naturally if it's there in the rules it's there. This was not the first time Buttler had been run out backing up too far. On air in host broadcaster Star Sports' "Dugout", Kumar Sangakkara pointed out how, in a game against Sri Lanka in 2014, Buttler was run out in a similar fashion after two warnings by Sachithra Senanayake. Royals' coach Paddy Upton, though, didn't bother about the technicalities. He was miffed, and it showed in the press conference. There cannot be a more cruel joke than an Aussie speaking on the spirit of the game ! Buttler was looking in control of the chase of 185 at that time, having scored 69 off 43. His wicket, though, triggered a collapse as hosts Rajasthan Royals lost seven wickets for 16 runs to lose by 14 runs. At the end of the match, Buttler shook Ashwin's hand, but refused to look his way. Just behind Buttler, Upton seemed to have said something to Ashwin while shaking his hand, which made Ashwin stop in his tracks and give them a bemused look. Laws 30 to 39 discuss the various ways a batsman may be dismissed. Law 38: describes Run out. A batsman is out if at any time while the ball is in play no part of his bat or person is grounded behind the popping crease and his wicket is fairly put down by the opposing side. A batsman may be dismissed Run out whether or not a run is being attempted, even if the delivery is a no ball (i.e. not a fair delivery). The rule is very clear in the description “Running out a batsman "backing up". As a bowler enters his delivery stride, the non-striking batsman usually 'backs up'. This means he leaves his popping crease and walks towards the other end of the wicket so that it will take him less time for him to reach the other end if he and his batting partner choose to attempt a run. When the batsman leaves the popping crease before delivery, the bowler may attempt to run the non-striker out. This is clearly legal. The earliest of these type of out involved Vinoo Mankad and occurred during India's tour of Australia on 13 December 1947 in the second Test at Sydney. Mankad ran out Bill Brown when, in the act of delivering the ball, he held on to it and whipped the bails off with Brown well out of his crease. The Australian press strongly accused Mankad of being unsportsmanlike, though some Australians, including Don Bradman, the Australian captain at the time, defended Mankad's actions. After this this type of run out came to be known as ‘Mankaded’. There have been instances of such outs in Tests and in One dayers which includes : Brian Luckhurst by Greg Chappell, England v Australia, Melbourne, 1974-75; Grant Flower by Dipak Patel, Zimbabwe v New Zealand, Harare, 1992-93 and Peter Kirsten by Kapil Dev, South Africa vIndia, Port Elizabeth, 1992-93. Courtney Walsh of the West Indies famously refused to mankad last man Saleem Jaffar of Pakistanfor backing up too far in a group match in the 1987 World Cup, but let him off with a warning. Pakistan went on to win the match while the defeat cost the West Indies a place in the semi-final. In 2012 at Srilanka, Sehwag went gone one step further, withdrew the appeal after Ashwin breaking the stumps and appealing; - the result was similar though, Indians losing the match !!!!!!!! In the U19 WC at Bangladesh, Keemo Paul effected a mankad to claim the last Zimbabwe Under-19 wicket - that of Richard Ngarava - with three runs needed off the final over. Paul ran through the bowling crease without entering his delivery stride and broke the stumps, catching the non-striker Ngarava with his bat on the line while he was standing a couple of steps out of his crease. Jos Butler is a classy cricketer but knows or remembers little of past. Let Butler, Upton and others turn the pages of almanac to read about the first Test played at Wankhede Statdium in Nov 1981 – Test No. 911 – a bitter one as India won by 138 runs. Krishnamachari Srikkanth made his debut – out for a duck in the first innings. In the second essay, he was extremely nervy; he had the peculiar habit of walking towards the square leg umpire after every delivery. He fended one towards the slip and took his casual walks – not attempting a run but out of the crease. John Emburey at the slips threw the wickets down and the whole England team celebrated ! Srikkanth was declared run out. That day, it was well within the spirits of the game – Gavaskar openly admonished Srikkanth and there was the remorseless remark that this boy should learn that this is not ‘juhu beach and he is not going for a walking’ ! For all those pundits – do we require the Wicket keeper to warn the batsman before effecting a stumping ? ~ you are outside the crease, you are likely to get out ! !